Last summer was especially wet and it was raining on the day I arrived in Gyeongju. But unlike the torrential downpours that drenched Seoul, raindrops fell gently from the tiled roofs of traditional Korean houses, prompting this traveler to stop for a moment to take in the beauty and atmosphere of this historic city. Even the brewery that makes beopju, a traditional Korean liquor made from glutinous rice, was filled with the sound of raindrops falling. The brewery is located inside a hanok -- archaic Korean houses known for their rafter-exposing roofs -- and if it weren't for the sign that read "Gyodong Beopju," I would have passed right by it. Inside the hanok was a tranquil garden and on the other side of the house sat an elderly woman. She called over her daughter-in-law, who explained to me the history of the brewery. I found out later that the elderly woman was the facility's certified distiller. 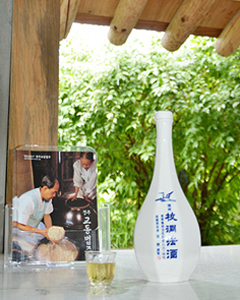 Gyodong Beopju, one of Korea's most famous liquors, is a home-brewed rice wine that has been passed down from generation to generation by the Gyeongju Choi clan and now boasts a history of more than 300 years. Made with glutinous rice and nuruk, or rice malt used for fermenting, it was created for ceremonial use or to entertain guests. But in 1986, this particular brand was selected as an Important Intangible Cultural Property of Korea and came into focus as the representative liquor of Gyeongju. This paved the way for commercial sales starting in 1992. The brewing process is so sensitive to heat and humidity that Gyodong Beopju can only be made between September and April of the following year. It does not use any preservatives and cannot be kept indefinitely on store shelves. Customers have to visit the brewery to purchase it, although plans are being made to sell it over the Internet. Many people suggested that the family expand the brewery into a major production facility and set up an extensive distribution network, but so far the Choi family has insisted on staying local to preserve the liquor's traditional taste. The clear, yellowish liquor has a strong yet sweet flavor and leaves a fresh taste in the mouth. This reminded me of the history and traditions of Gyeongju. Maybe because it was not as strong and pungent as Chinese Baiju, Gyodong Beopju's refreshing taste and smooth texture make it just as attractive to women as to men. Visitors to the brewery can also enjoy a quiet stroll through the historic home of the Gyeongju Choi clan. 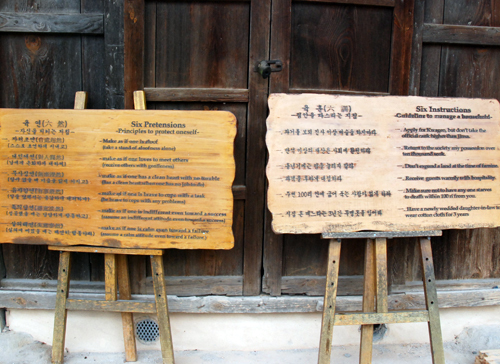 Wooden signs explain the family mottos of the clan written in Chinese, English and Japanese. "Any possession beyond 10,000 bales of rice should be given to charity," "Do not expand cropland during droughts," "Make sure that nobody is starving within a 400-m radius of where you are." Those family mottos, which stress sharing and benevolence, remain valuable teachings. 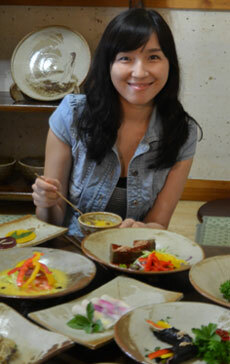 After finishing my tour of the brewery, I went to a vegetarian restaurant nearby that makes dishes using lotus leaves. Adding to the ambience were decorations that featured the lotus leaf as a running motif. 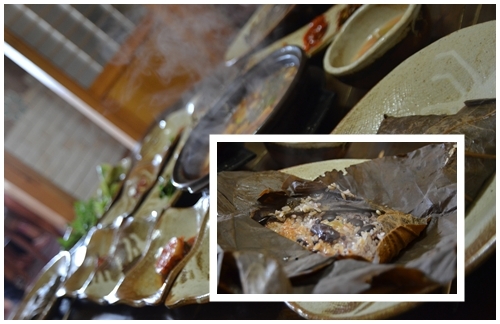 The dishes were not only delicious, but aesthetically pleasing, especially the rice wrapped in leaves. This came mixed with black beans, lotus roots and jujubes, and offered an entirely different taste from Chinese lotus rice, which is steamed using glutinous rice, pork, seafood and starch. The vegetables and herbs offered as side dishes beautifully complemented the main course.